Longtime Green Ronin fans will recall that our very first product, released eighteen years ago, was Ork! The Roleplaying Game. This beer ‘n’ pretzels RPG was a blast to play. We’ve had a lot to do since then, however, and Ork! didn’t see additional releases. Until now! Shut up! You am Ork! 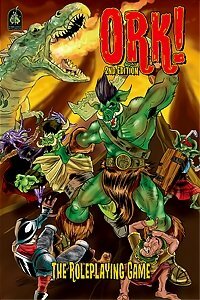 Enter the bone-cracking World of Orkness with Ork! The Roleplaying Game. This new edition is the standalone, streamlined roleplaying game of orkish mayhem: a “beer and pretzels” game where monstrous, hilarious adventure matters more than rules and tables. Claw your way out of the Gunk Pit, earn your name with acts of spectacular violence, and bring terror to the Squishy Man villages in the name of Almighty Krom. Includes a blood-soaked combat system, other, lesser rules, and a complete series of adventures to take your orks from nameless youth to sharp-toothed, unholy terrors–if you can avoid the wrath of Krom. Being a monster has never been such fun!